Businesses and government offices slowly reopened across Haiti on Monday after more than a week of violent demonstrations by hundreds of thousands of protesters. 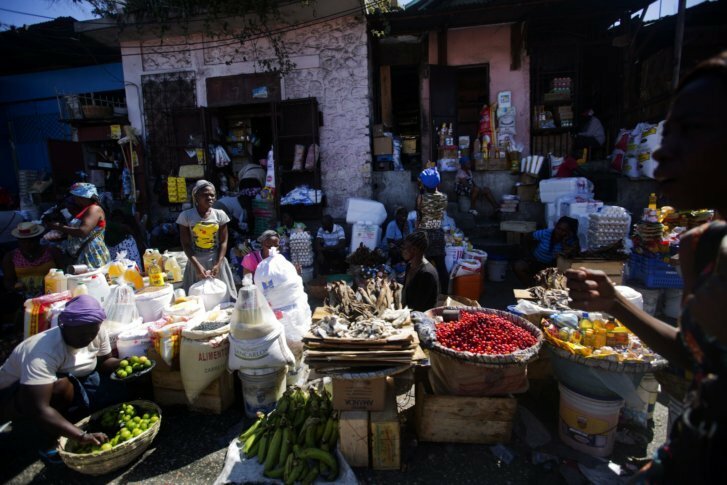 PORT-AU-PRINCE, Haiti (AP) — Businesses and government offices slowly reopened across Haiti on Monday after more than a week of violent demonstrations by hundreds of thousands of protesters demanding the resignation of President Jovenel Moise over skyrocketing prices that have more than doubled for basic goods amid allegations of government corruption. Public transportation resumed in the capital, Port-au-Prince, where people began lining up to buy food, water and gasoline as crews cleared streets of barricades thrown up during the protests. Moise has refused to step down, though his prime minister, Jean-Henry Ceant, said over the weekend that he has agreed to reduce certain government budgets by 30 percent, limit travel of government officials and remove all non-essential privileges they enjoy, including phone cards. Ceant also vowed to investigate alleged misspending tied to a Venezuelan program that provided Haiti with subsidized oil and said he has requested that a court audit all state-owned enterprises. He also said he would increase the minimum wage and lower the prices of basic goods, although he did not provide specifics. Many Haitians remained wary of those promises, and schools remained closed on Monday amid concerns of more violence. “The government is making statements that are not changing anything at this point,” said Hector Jean, a moto taxi driver who was waiting for customers. He recently had to buy a gallon of gas for 500 gourdes ($6), more than twice what he normally pays, and he has been unable to find customers who can afford to pay higher fares. Other goods in the Western Hemisphere’s poorest nation have also doubled in price in recent weeks: A sack of rice now costs $18 and a can of dry beans around $7. In addition, a gallon of cooking oil has gone up to nearly $11 from $7. Inflation has been in the double digits since 2014, and the price hikes are angering many people in Haiti, where about 60 per cent of its nearly 10.5 million people struggle to get by on about $2 a day. A recent report by the U.S. Agency for International Development said about half the country is undernourished. Dozens of people on Monday stood outside a financial services company waiting to pick up money transfers from relatives abroad. Among them was 35-year-old Andre Simon, a taxi driver who had been standing in line for at least three hours and has been unable to work for more than a week. The latest violent demonstrations prompted the U.S. government to warn people last week not to travel to Haiti as it urged Moise’s administration to implement economic reforms and redouble efforts to fight corruption and hold accountable those implicated in the scandal over the Venezuelan subsidized oil program, known as Petrocaribe. A Haitian Senate investigation has alleged embezzlement by at least 14 former officials in ex-President Michel Martelly’s administration, but no one has been charged. Meanwhile, Haitians have demanded a probe into the spending of the $3.8 billion Haiti received as part of the Petrocaribe program. She said she doesn’t believe claims that opposition leaders are behind the demonstrations or that people are being paid to protest as has happened in previous years given the incredible number of people that have taken to the streets in recent days. However, Kolbe warned that even if Moise were forced to step down, it would not resolve one of Haiti’s underlying issues: how to address corruption. “People are just kind of exhausted with the business elite running the country and retaining control and not knowing where public funds are going,” she said. Martelly hand-picked Moise in 2015 to be the candidate for the ruling Tet Kale party even though the businessman from northern Haiti had never run for office. Moise was sworn in as president in February 2017 for a five-year term and promised to fight corruption and bring investment and jobs to one of the least developed nations in the world. His swearing-in marked Haiti’s return to constitutional rule a year after Martelly left office without an elected successor amid waves of opposition protests and a political stalemate that led to suspended elections. Moise’s administration previously set off deadly protests in July when officials abruptly announced double-digit increases in the prices for gasoline, diesel and kerosene as part of an agreement with the International Monetary Fund to eliminate fuel subsidies and boost government revenue. At least seven people died in those protests, which also forced Prime Minister Jack Guy Lafontant to resign after facing a no-confidence vote in parliament. Associated Press writer Evens Sanon reported this story in Port-au-Prince, Haiti, and AP writer Danica Coto reported from San Juan, Puerto Rico.